Welcome to International Wire Netting Industries, Manufacturer and Exporter of Wire Mesh, Conveyor Belts and Industrial Screens. We are an ISO 9001:2008 certified company, established in 1985 at Mumbai. We export to UAE, Bahrain, Kuwait and other countries. Client centric approach and multiple payment options help us to serve Key customers like Essar Group, Aditya Birla Group & others. We offer a vast range of Industrial Wires, Wire and Stone Falling Wire Meshes. Our Construction Fencings and Industrial Screens are acknowledged for their functionality. We offer Conveyor Belts, Industrial and Expanded Metals Sheets that are best in the industry amongst others. Filter Discs and Mist Eliminator Pads offered by us are nothing but the best solution for all your needs. Along with that we offer Vibrating Screens for Construction Industry that are a class apart. 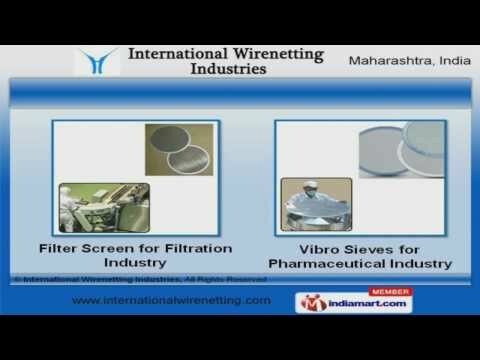 We also provide Vibro Sieves for Pharmaceutical Industry that are extremely reliable.